This is so pretty! These colors!! This is also very versatile. Change the spice to suit your taste buds. Use whatever veggies you like or have. Make it spicy, make it sweet, make it both. This is great with burgers, or on pork tacos. Or add diced grilled chicken. Make it yours! Throw every thing in the blender and pulse to get the consistency you want. Pour into jar and let this sit a couple of hours. 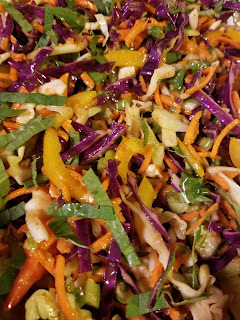 Use whatever combo of veggies you want, shredded, chopped, julienne- whatever shapes you prefer. Veggies I think would work in this: carrot, celery, green onion or sweet onion, purple cabbage, white cabbage, cauliflower, zoodles, cucumber, bell peppers, jicama, yellow squash. Mix the veggies, with as much dressing as you like. Top with garnish.